This premium antivirus suite is a budget-friendly option for households with many systems. 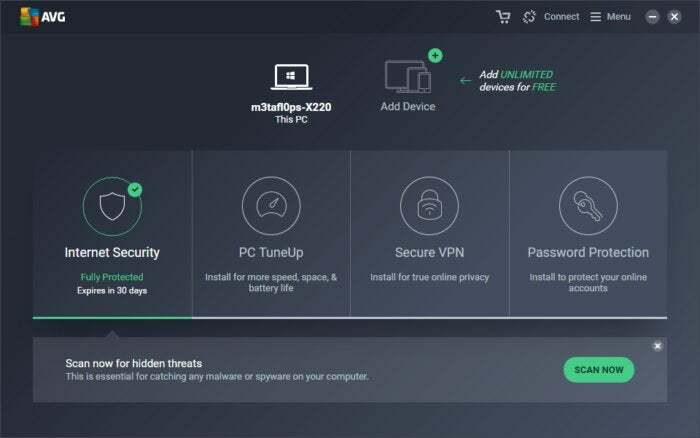 AVG has a big advantage in the free antivirus space since it owns both Avast (acquired in 2016) and its homegrown product, AVG Free. The hope is that you’ll love the free stuff so much that you’ll eventually upgrade to one of its paid products. In the case of AVG, most people go with its Internet Security program. Priced at $70, it’s one step down from the company’s flagship product, AVG Ultimate, and lacks a number of Ultimate’s less crucial features. For example, you don’t get AVG’s PC tune up package or third-party desktop software updater. That’s hardly a loss, though, as you can find free programs to dump cached folders taking up too much space or monitor software updates. The important security features are all included in the $70 security suite, however, including antivirus, firewall, and phishing protection. Unlike Avast, AVG opted not to include a password manager as part of its various security packages. Instead, you have to fork over an extra $20 per year to make that a part of your security set-up. That’s not a bad price, though for a few bucks more you can get an annual subscription to LastPass. When you first open up AVG, it offers a similar aesthetic to its corporate counterpart Avast. The app largely has a gray background with bright green to highlight important information. You’ll first see a status dashboard that lets you know which AVG security features are active. 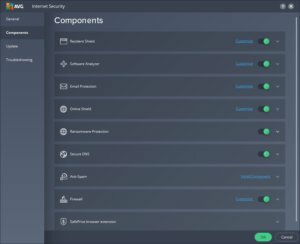 AVG Internet Security’s primary dashboard and menu. This dashboard is not intuitive, though. Almost nothing is clickable in the main part of the screen. To tweak most options, you have to click on the Menu hamburger icon at the top right of the window. There you can get into the nitty gritty of the application’s settings, including general options, controls for ransomware protection, a data safe (encrypted folders), and a file shredder feature that overwrites deleted data to make it harder to recover. 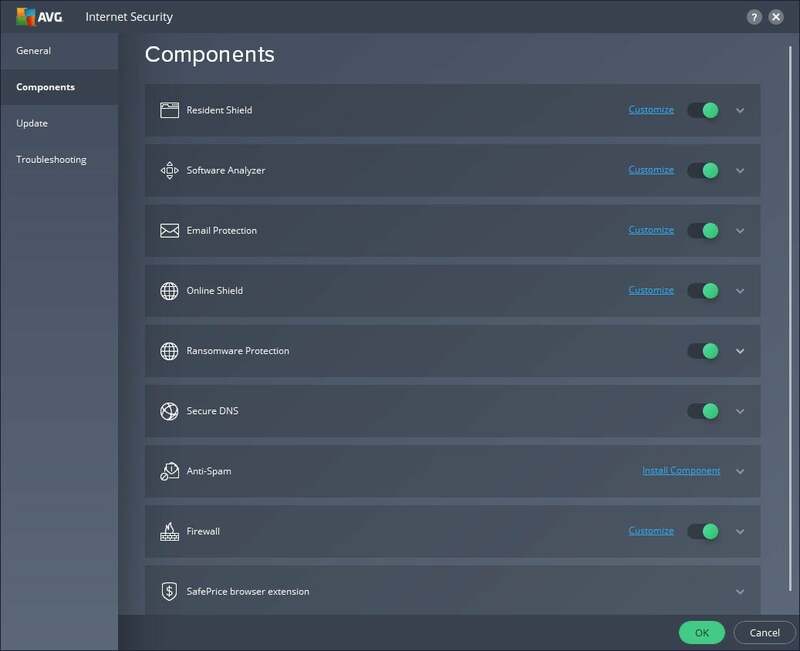 AVG Internet Security’s Components settings. Overall, the settings could be better organized and made clearer. Most of the key settings you’ll want to access, for example, are under Menu > Settings > Components. From there you can tweak your firewall and play with the spam scanning settings. Reinforcing my point about organization, however, is how the options are laid out. Each part of the component settings is hidden under a downward facing arrow. Click that arrow and you reveal each section’s panel, but all you’ll see is an explanation of the feature and an option to uninstall individual parts of the security suite. To actually get deeper into those firewall settings, you have to click the Customize link in each tile, which is never hidden. AVG Internet Security’s secondary dashboard. To access other options, like subscription information, you’ll have to go back to the main dashboard. In the upper left hand corner is an arrow—when you click on it, it opens another window where you can add another device to your subscription, as well as download and subscribe to other AVG products such as PC TuneUp, Secure VPN, and Password Protection. This window is very reminiscent of Norton Security. AVG’s overall interface is not a deal breaker, and once you get used to the logic of the application, it’s not hard to navigate. However, during testing I often kept thinking about its Avast counterpart, which I found to be far more intuitive with items more readily accessible and not buried under a mountain of clicks. 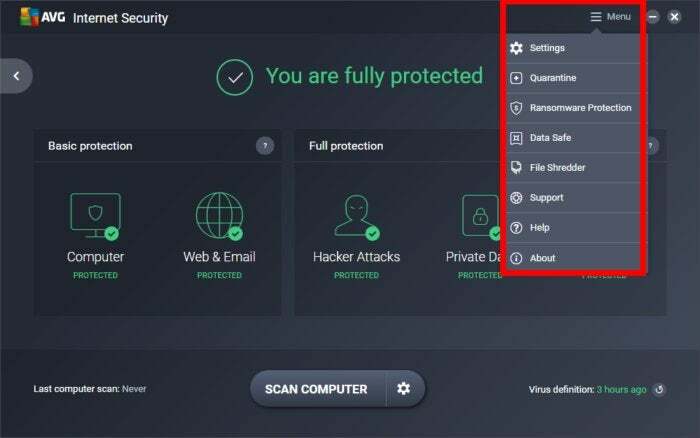 One thing that AVG Internet Security does make very easy is the ability to scan your PC, as the Scan Computer button is the most prominent item on the primary dashboard. Like many of the mainstream security programs, AVG got very high marks for antivirus and malware protection. A-V Test’s August tests gave AVG 100 percent detection in its 0-day and malware tests. In A-V Comparatives’ real-world protection test, meanwhile, AVG scored 100 percent as well with three false positives out of 329 samples. 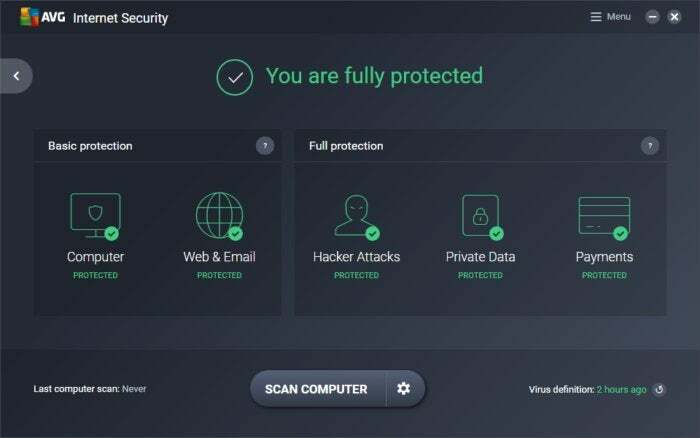 When pitted against A-V Comparatives’ malware protection test, AVG scored 99.8 percent in an online scan against nearly 38,000 samples and 98.8 percent offline. SE Labs gave AVG an AAA rating, saying that both it and Avast were the most effective free software in its tests, but AVG did fail to detect five targeted attacks. All three organizations used the free versions of AVG’s antivirus, which doesn’t have the ransomware, firewall, or phishing protection. AVG also did well in our performance benchmarks. When we ran PCMark 8’s Work Conventional test (a simulation of everyday tasks like word processing, web browsing, and video chat), our initial score was 2521. With AVG running in the background, that score was 2524—a tiny enough difference that the improvement could be chalked up to margin of error. Our Handbrake test, which puts much more stress on a system, showed no significant performance dip. Our Windows 10 PC takes an average of one hour, 15 minutes, and 30 seconds to transcode a 3.8GB MKV file using the Android Tablet preset. With AVG installed, Handbrake transcoded the same file in one hour, 15 minutes, and 25 seconds. AVG leaves a lot to be desired when it comes to app design, especially compared to Avast. Given that the same company owns both development teams, we hope to see some improvement. Nevertheless, AVG gets high marks for security, has enough features to satisfy most users, and doesn’t drag on your performance.